On the eve of National Asbestos Awareness Day, the Asbestos Diseases Foundation of Australia has warned of a “third wave” of exposure to asbestos, as DIY home renovations spike in popularity. Friday, 28 November, marks National Asbestos Awareness Day, where groups will come together to pay tribute to the thousands of Australians who have died from asbestos-related diseases. However, the day also exists to remind the community of the present threat asbestos poses. Currently, 600 mesothelioma cases are reported a year, and this is expected to rise to more than 900 cases a year by 2020, with the National Health and Medical Research Council estimating that more than 25,000 Australians will die from mesothelioma over the next 40 years. “There is no safe level of exposure to asbestos fibres,” Asbestos Diseases Foundation of Australia president Barry Robson said. “In the past, the first wave of people affected by asbestos-related diseases were those exposed to fibres in the mining and manufacturing process and their families. Then came the second wave, which were people exposed to fibres from using products in the workplace. 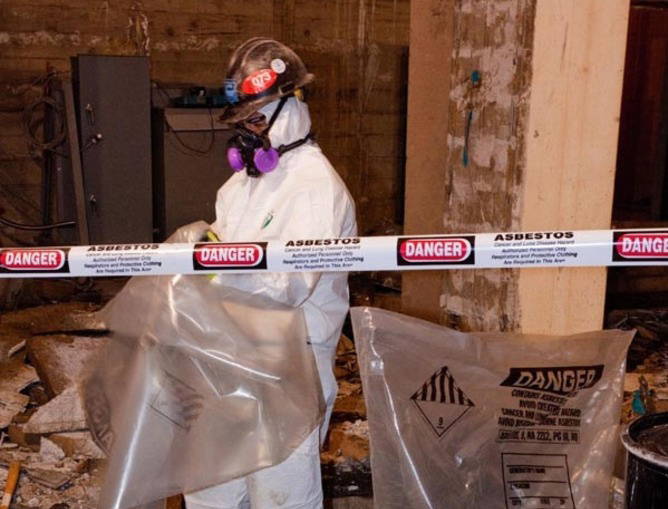 The foundation is warning of a “third wave” of asbestos-related diseases that will include people renovating homes without the proper precautions. Mr Robson said one in three Australian homes contained asbestos in some form. In a study reported in Medical Journal Australasia, more the 60 per cent of survey respondents that had conducted renovations reported being exposed to asbestos dust, with 53 per cent of partners and 40 per cent of children exposed. “Asbestos is the only known cause of mesothelioma, and if tradies, handymen and DIYers release dangerous asbestos dust and fibres during renovations or in the demolition of homes containing asbestos, fibres can be inhaled, increasing the risk of developing malignant mesothelioma or lung cancer,” he said. There is no cure to mesothelioma, with the average survival time after diagnosis just 10-12 months. Inhaling asbestos fibres can also cause diseases such as lung cancer, asbestosis and benign pleural disease. Chair of the Asbestos Education Committee Peter Dunphy said that Australia had one of the highest rates of asbestos-related diseases in the world. “This is because Australia was among the highest consumers of asbestos products with more than 60 per cent of all asbestos product manufacturing, and 90 per cent of all consumption of asbestos fibre used in asbestos cement until a complete ban of asbestos came into force in Australia in 2003,” Mr Dunphy said. He said that if in good condition and left undisturbed, asbestos did not generally pose a health risk. “However, with the aging of homes, the popularity of DIY, renovating, knock-down-rebuild and with the redevelopment of old fibro home sites, it’s important that anyone working in or around homes or buildings constructed or renovated before 1987 know the dangers of asbestos and learn how to manage it safely,” Mr Dunphy said. “No one can tell if a product contains asbestos just by looking at it and it’s not only fibro homes that may contain asbestos. Asbestos could be anywhere. Under floor coverings such as carpets, linoleum and vinyl tiles, behind wall and floor tiles, in cement floors, internal and external walls, ceilings and ceiling space (insulation), eaves, garages, roofs, around hot water pipes, fences, extensions to homes, garages, outdoor toilets, backyard and farm sheds, chook sheds and even dog kennels. Visit asbestosawareness.com.au for more information. message in this article is an important one and Judy’s comments are right on point. In addition to the information provided one may also consider secondary exposure to asbestos through contact with loved ones who have been working in or around asbestos laden areas. There are numerous instances of people who never had direct contact with asbestos in their work environment but later became affected by malodies such as mesothelioma or asbestosis. One story I recently read reported a young girl, about 25 years old, was suffering from mesothelioma. At first glance this appears unlikely because of the long latency period associated with mesothelioma. As it turns out this young lady’s father worked in a shipyard and she would greet him each day when he came home from work with a big hug and kiss. This warm greeting placed her in direct contact with his clothing which carried the asbestos fibers from his work environment home to his family. Hoping that with the changes with local Councils taking more action on this front, how about the hire companies who may not be aware that their products eg vacuum cleaners etc may have been used -knowingly or unknowingly and then not cleaned and de-contaminated with stringent precautions and procedures in place -creating potential risks and hazards for the hire company staff and the products used …..just a thought …. Mad Men (and women) for the Planet has a winner!